Peter, after intense examination and a series of personality tests, is selected to go on a mission in space. He is chosen to serve as a catholic priest for a colony of humans living on an extraterrestrial planet. He has no idea what, or who, to expect on this mission, but he knows that spreading the word of God is one of the most important jobs of every Christian. With that in mind, he is not afraid to preach the verses of the Bible to whoever is willing to listen on this new planet. Yeah, that was a pretty broad synopsis…but I have to be really careful with my words or I might spoil something big. So, please, allow that fragment of a plot summary to suffice for this review. This book started out extremely slowly. I almost put it down about 50 pages in. I’m glad I kept going because it starts to get interesting and creepy around page 100. The books starts flying after that and it’s really hard to put down. Peter is really annoying at first, which is why it’s hard to get past the first hundred pages, but I came to like him. I was initially interested in this book because people seemed to have such a hard time placing it into one specific genre. 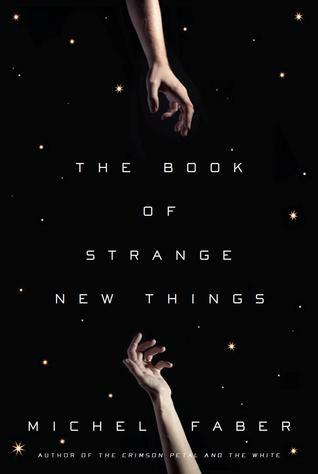 I’d say that this is definitely science fiction, with a touch of horror and thriller. Those three make for a great and captivating read! I was really, really disappointed with the ending. It felt extremely unsatisfying and a bit confusing, even after re-reading the last chapter a few times. There are so many things/lessons that Faber could have finished with, but he just hastily wrapped it up without giving the reader a good sense of conclusion. Still, this was a great read and I’m happy it was at the top of my 2015 TBR. A good way to start off the year!